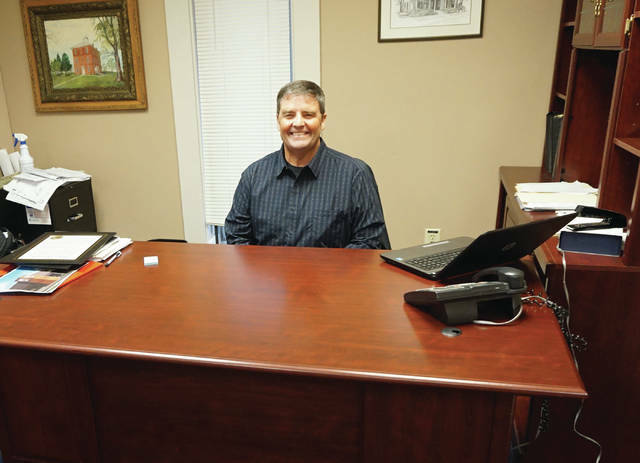 Sunbury Mayor Tommy Hatfield at his desk. Sunbury Mayor Tommy Hatfield is upbeat about the village’s growth. He moved to Sunbury 15 years ago, after growing up in Harlem Township, and “became very interested in local government,” he said in an interview conducted a few months ago. “At this level, this is not about politics — being a Republican or a Democrat. It’s about doing what’s right for the community. Working with Delaware County to come up with some boundaries that the county serves some of the village, and the village may serve outside of our boundaries,” Hatfield said. Although Sunbury’s boundaries have grown in recent years, its town square remains a focal point. As a jogger, he wants to work with the Village of Galena to connect trails so Sunbury can be a destination stop for bicyclists. “There’s a lot of interest now being able to walk and ride to places like the outlet mall from downtown Sunbury and getting to Westerville. So, we really see that as an opportunity to continue to grow and put that together. Hatfield said Sunbury has worked with Delaware County and regional planning commissions regarding future development. He acknowledged that not everyone likes the growth. “I’ve said all along, I would love Sunbury to stay as the way it was five years ago, but I recognize that you can’t do that. Things don’t stay the same. You’re either growing or you’re shrinking — there’s no just staying where you’re at. We’re blessed to live in an area where people want to raise their kids here, they want to come here. To me, that’s the tough balance — you can’t put your head in the sand and ignore it and think it will go away, because it’s going to happen. In anticipation of becoming a city after the next U.S. Census, Hatfield said Sunbury will set up a charter commission. And while Sunbury Village Council meetings can still take a few hours, recent additions have made for productive sessions. “When I first started as mayor, our meetings had been entertainment for the newspaper, so much drama. But over the last couple years, things have been really quiet. We have a good working group of council folks. What Hatfield loves most about Sunbury is the people, who he said has treated him and his family well. “Sunbury and the people who live here, we’re proud of our village the fact that the Big Walnut community still look out for one another. I know the years I’ve been on council, when you start to see all the people behind the scenes, whether it’s volunteering for the Big Walnut Friends Who Share or local churches, it’s the people that makes all these things happen. It takes a lot of effort, whether it’s the chamber of commerce or a growing civic organization really starting to put on some nice events.